Happy Monday everyone! Traditionally, today’s post would be part of Mountain State Monday but instead, I decided to do another Made in West Virginia post so you can go ahead and get started on your handmade holiday shopping. To recap, I wanted to share with you some of my favorite items and gifts that are made right here in the Mountain State and challenge you to purchase one handmade item for every mass market item you buy this holiday season. It is impossible for me to show you EVERYTHING, so please consider this a few highlights of the offerings out there. So far, the Made in West Virginia series has featured great gift ideas for Jewelry (check out that post here) and will continue today with ideas for Fashion & Accessories. Hand dyed and weaved from luxurious natural fabrics, Wenweave offers a variety of scarves, pashminas, and shawls that are the perfect outfit accessory. The color combinations are endless and blend beautifully for a one of a kind piece. Bonus? They’re incredibly soft! A bag for every occasion, Handbags by Tennile offers a variety of items from totes to clutches to crossbody bags and even child-size bags that are perfect for the young fashionista in your family. She has a large selection of prints and styles, both festive and professional, to suit every personality, style, and budget. Customization is available. Known for his whimsical leather shoes, Mik Wright of Those Shoes is also an expert in accessories with a full line that includes small pouches (as shown above), checkbook holders, and business card cases. 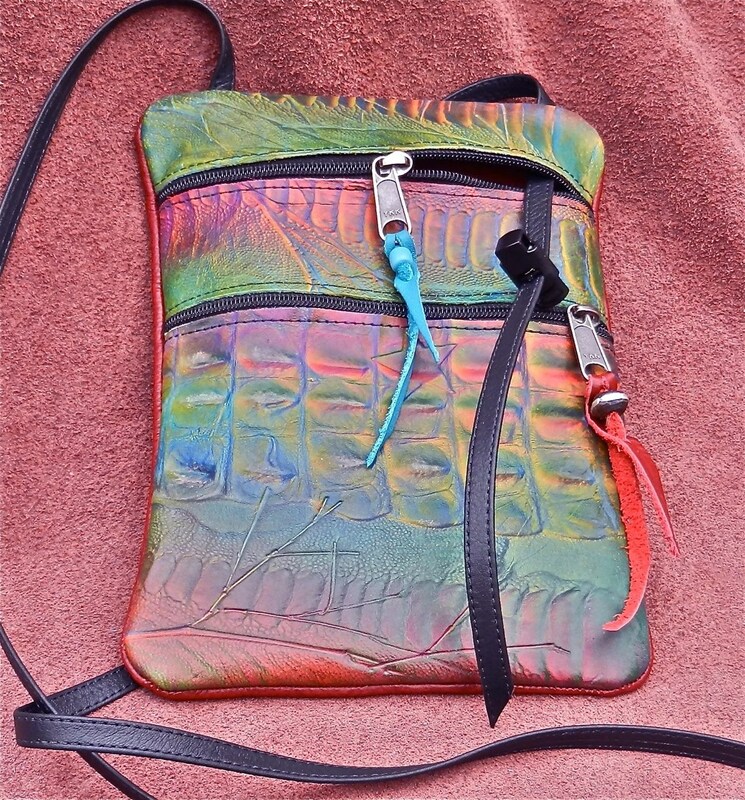 Each item is made out of hand dyed and hand cut leather in virtually any color, always finished with fun designs and patterns. You can also customize any product. Tatiana Rakhmanina’s hats are perfect for the sophisticated person in your life who loves to express her personality in the most notable ways. Her hats and head bands make any occasion special and are a key item to have in your closet. Offering a full line of fashion that encompasses purses, aprons, and even clothes, Kniceley Sewn also has fun hair accessories for all ages from dramatic to adorable. She especially caters to kids by creating matching “felt clippies” (pictured above) that coordinate with custom outfits — perfect for the young lady on your list! If clothing is on your list but you don’t want something you can pick up off the racks of a chain retailer, then Nikki Buttler Design is the go-to designer for funky, fresh clothes. From silk belts to tunics like the one pictured above, her styles are glamorous and right on trend. 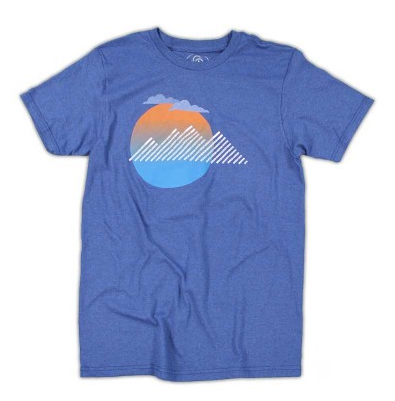 For that guy or gal on your list who prefers a simpler look, SustainU is a great go-to for t-shirts. Although the actual products are produced in neighboring states, SustainU is headquartered in West Virginia and feeds into the Mountain State economy. All products are Made in the USA, so you can still feel great about shopping small. Stay tuned this week and next for more gift ideas! Next time, it will be all about Bath & Body products followed by Home Decor & Furniture. Disclaimer: I may know and may own an item from the artisans listed in the above post. However, all opinions are my own and are not influenced in any form. Also, I do not own any of the photos listed above; they were all retrieved from the artisan’s website. Please let me know if there is any conflict and I will remove the photos.